Ben Vincent surprised me with a picture of the Chanco Lodge 1975 Fall Fellowship patch which was the last one that I needed to complete pictures of all known Chanco Lodge activity patches. 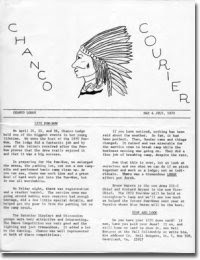 You'll find the photo linked (along with all the rest) on the Chanco Lodge Activity Issues page. 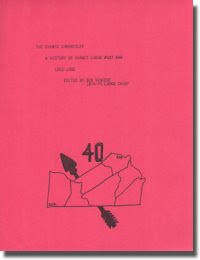 The events are cataloged using the issue numbers in the 6th edition of the Blue Book Standard Order of the Arrow Insignia Guide. 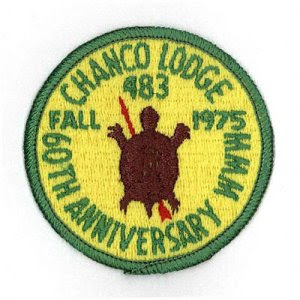 You'll note that the patch includes lettering referring to a 60th Anniversary, but Chanco Lodge was founded in 1952. The anniversary refers to the Order of the Arrow, which was founded in 1915. The turtle you see on the Chanco patch references one of the symbols adopted by the first OA Lodge, Unami 1 of Philadelphia. PA. Many thanks to all of the fine Arrowmen who have helped me complete this set of activity patch images. The Pamunkey Chapter Chatter provided a special sneak peek at the Lodge 333 event patches planned for 2009 in their most recent edition. The lead feature of the January 12 edition is Pamunkey artist wins lodge patch design competition and the accompanying illustration displays the patch concept developed by youth member Ethan S. which was approved by the Lodge Executive Committee at their January meeting. According to the story, "the patches feature a lighthouse flanked by arrows piercing the initials OA. The background color of each patch changes with the season. From left to right above: Winter, Spring, and Summer Service Weekends, Fall Fellowship, and Holiday Banquet." The changing background for the seasons is a theme honored by Wahunsenakah event patches in prior years, as well, and it's nice to see the tradition continue.